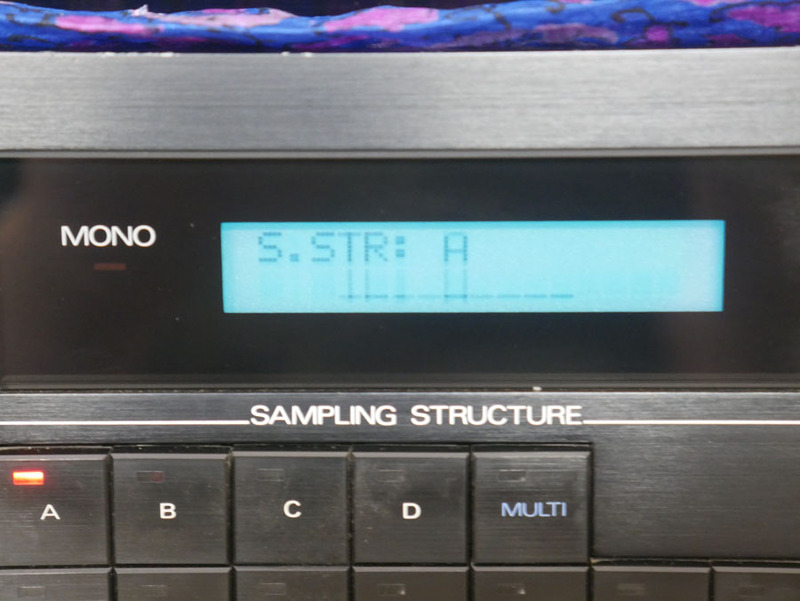 Introduction In February 2018 I bought a Roland S10 sampler for £50, which looked in reasonable condition on eBay but with the usual QD drive failure. My plan was to re-use the 4 octave keyboard in another project, as S10’s often have had a hard life! However once I had cleaned up the sampler at home, I found it worked well except for the drive, so I decided to keep it as a sampler in my workshop and restore it back to the best condition I could by replacing the worn out components. 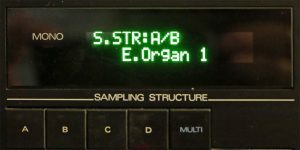 The sampler may have been bought and used by J-M-J originally, so it seems a good idea to save it. This post details the refurbishment work that has been done. 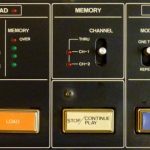 History The 12-bit S10 keyboard sampler was introduced in May 1986 at an initial price of £1099, and sold strongly in 1986/7 with over 8000 manufactured before it was phased out with the arrival of the 12-bit S330 in early 1988. 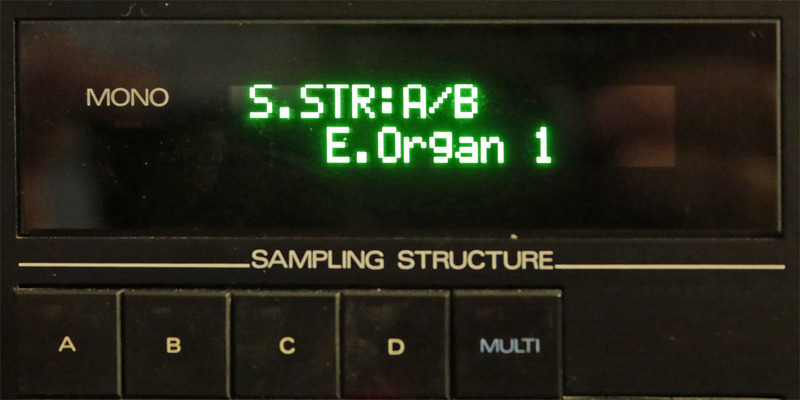 In February 1988 the S10 was was being blown out at £699 and the S10 was one of the cheapest ways of getting into sampling, albeit just 4 seconds and with a really unreliable storage drive. 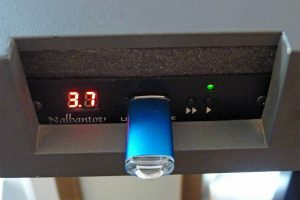 The S10 and its rack mount brothers the MKS100 and S220 have fallen out of favor with musicians and can easily be found secondhand for under £100, they are actually quite usable and immediate. LCD to OLED The 16×1 blue back lit LCD had faded significantly (as expected) with the EL reaching end of life and the inverter whining. Take a look at the picture, hard to use a sampler with a faded display with just 16 characters! This was the first component to be replaced on the S10. I used a modern OLED display which provides a much clearer display and wide viewing angle. There is no need for a contrast adjustment. The OLED I fitted is the Vishay O016N001AGPP5N0000, which is the correct overall size of 80mm x 36mm and has a green character colour. I bought it from Mouser for £13. It is an easy fit once the main front panel has been removed, and the LCD holder unscrewed. The inverter cabling to the power supply and inverter are removed, and the LCD cable desoldered from the old display and moved to the new display. The contrast cable wire is not required and should be removed (it did go to Pin 3 on the display). The new display works fine but only displays the first 8 characters, just like the Alpha Juno displays upgraded to 16×1 OLED’s. The solution is to hack the operating system which is fortunately on a separate ROM chip. All the 2nd line display commends have to be revised to use 8h in addressing rather than 40h. 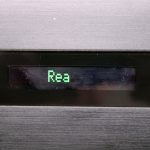 I want to keep the OLED, so a firmware hack has to be done! The OS code can be downloaded as a binary and I now need to reverse engineer it. The firmware for the Alpha Juno has been successfully hacked to use a modern OLED, so I will follow the same route and disassemble the binary into the source assembler code. Then make the change , assemble and create a new ROM. I will post progress on this and the final ROM code. Panel Switches Some of the button switches were a little unresponsive after 33 years, so I bought a complete new set of 30x from Mouser. This is much cheaper at just £5 than using eBay. 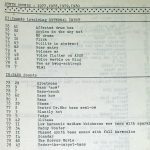 The Alps part number you need is: SKHHAMA010. I clipped off the old switches, desoldered the legs and removed the old solder, then soldered in the new switches making sure they are flat against the PCB’s. I removed and cleaned the PCB’s along with button caps. If you need switches for the MKS100 or S220 they are Alps SKHHBSA010, also available from Mouser. Panel Buttons Two of the buttons were badly damaged, still usable but I have replaced them with NOS items. A bit expensive but worth it. Keys A couple of the white keys had minor damage, a visible cigarette burn melted into the top surface and a black spot of corrosive paint to mark the upper split point (why?). I was able to tidy these up with a craft knife and some sandpaper, so I did not need to buy replacement keys. All the keys had to be thoroughly cleaned with soapy water, as they were filthy, I use shower glass cleaner. Two of the keys did not work, so the whole keyboard has to be removed and the contacts cleaned. Slider Dust Cover The S10 has a dust cover for the 3 slide potentiometers to the left of the keyboard. The dust cover had perished and looked awful sitting in front of the sliders and visible through the plastic bezel. I cleaned the slider and bender plastic bezel after removing it from the sampler, and removed the bend lever (to clean it) along with the PCB. I could then remove the old dust cover, which is a push fit, and copied the outline onto a new one cut out of 2mm neoprene sheet. Quick refit of the parts and… Perfect and it looks much better! Battery The 3V lithium battery needed replacing after 30+ years, as on power on the Performance Data was lost, and a message came up on the LCD requesting the Bender range be entered. The battery is on the main PCB but tucked under the keyboard, so that had to come out! The old battery measured 3.29V, whilst the new one measured 2.94V, do not be fooled, a 30 year old battery needs to be replaced! A new battery was bought off eBay and soldered in. 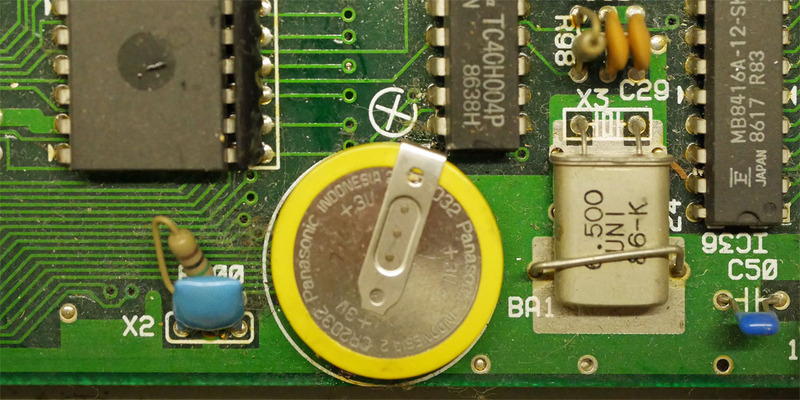 The old and new battery soldering can be done (carefully) with the PCB still mounted in the casing. Power Supply All the large and small electrolytic capacitors on the power supply PCB were replaced with new high performance versions with the same pin out and dimensions. Disk Drive The disk drive was in good condition with no motor whining but it failed to load QD disks. I took the drive out and it was immediately obvious that the belt had perished. I ordered a new drive belt from eBay (Germany) and in the mean time removed the old belt goo with isopropyl alcohol and cotton buds. The new belt was fitted and the drive worked perfectly after a few issues reading it settled in and worked. Disks The S10 sampler came with 16 Quick Disks in various conditions but only the 3 newer disks were readable and the rest were thrown away. S10 Manager I downloaded this software onto a Windows 7 PC and soon had it working well with the S10 (and S220’s), making sample transfer easy. I spent an evening working through the factory library, the JP8 Brass & Strings is the high light! 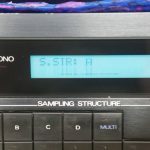 Introduction In October 2018 I bought a 31-year old Roland S220 sampler for £70, with no photo of it working this was a bit of a risky purchase! 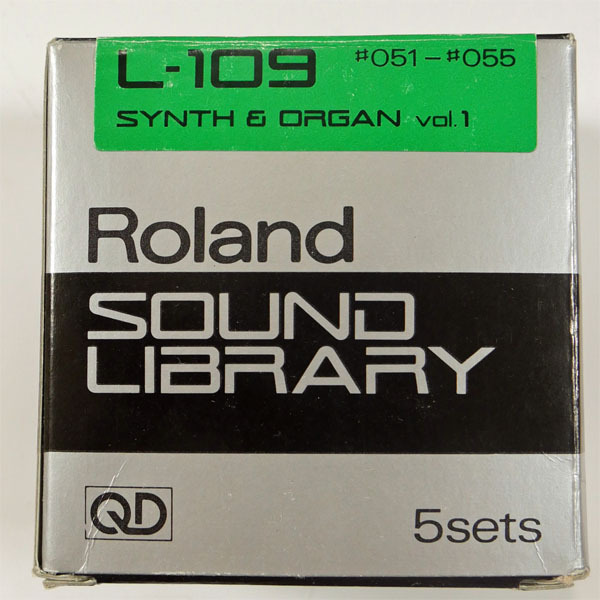 Why buy one in the first place, given it only manages 4.4 seconds of sample time at 30 kHz and 12-bits? Even the disk drive is horribly unreliable and impossible to replace or even find blank QD diskettes for. Well its that 12-bit lo-fi sample sound that I am after, so I can sample some modular synth sounds and create bass lines and strings. I also want to develop a Quick Disk drive replacement using a microprocessor, which will store 100 sample banks in memory. 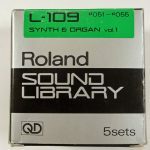 History The Roland S220 was introduced in September 1987 as an upgraded 16-voice version of the S10/MKS100 but with the same limited 256k byte RAM. It lasted about a year in production before the improved S330 was launched with 756k byte of RAM, so its a relatively rare sampler. The S220 received a new operating system with a lot of improvements over the S10 including 4-part multi-timbrality and up to 4 audio outputs and a good auto loop. There is an external trigger and arpeggiator, so it plays nicely with modular synthesizers. My S220 I bought a new mains lead and carefully powered it on, after checking there were no internal issues such as damaged power caps. It booted successfully but the LCD screen was extremely worn out and barely visible, so a new green 16 x 2 OLED display from Raystar Electronics (Part Number: REC001602AGPP5N) was bought for £22. You can buy the OLED in different colours, all part numbers start with REC001602A and they are the correct 80mm x 36mm size. New OLED Display It is a simple swap, the new LCD is the same size as the new OLED, and the EL back light power can be disconnected from the power supply. The front panel has to come out to gain access to the LCD, and the interface wiring has to be desoldered from the old LCD and re-soldered to the new LCD without pin 3 connected (no need for contrast). This is easy to do as the wiring unplugs from the motherboard. 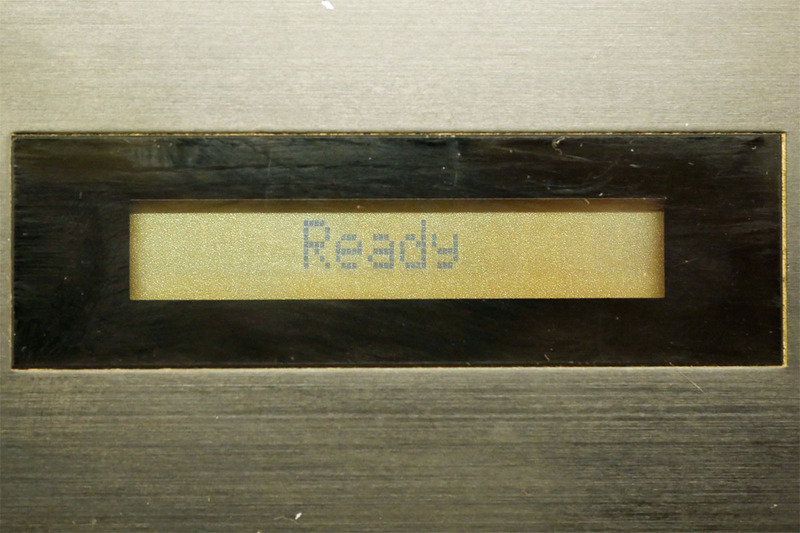 The OLED needs careful alignment with the front panel bezel so all the top and bottom of the characters can be seen. The character size of the new display is slightly larger, notice the tight fit of the lettering. Sample Disks I also bought a set of new Roland sample diskettes, the L-109 Synth & Organ, as it has a rather nice Jupiter 8 and VP330 sample bank. This loaded successfully on the second attempt after I cleaned the disk head and felt pad. 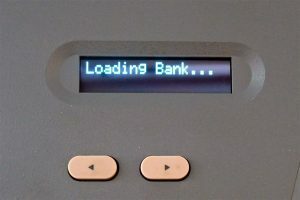 Amazingly the QD drive works, although it is easy to do sample bank transfers over MIDI using the S10 Manager software. Second S220 A couple of weeks later I bought a second S220, but this was in much worse condition . The electronics seem okay but the QD motor was permanently on and whining loudly, and the drive belt had melted. I did manage to reduce the whining and improve the head tracking but the Motor will not stop when powered on. So this S220 will be the “mule” for the QD drive replacement project. Maintenance The lithium batteries were replaced in both samplers, they keep power to the 8k bytes of Performance Data held in SRAM. A symptom of the battery failing is that the Bender range setting needs to be input at power on. 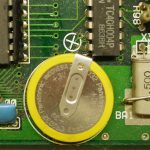 Don’t believe the voltage measured on the battery, even if its above 3V replace it. The old battery legs can be cut away and the new one soldered in place without removing the PCB. The power supplies were refreshed with new electrolytic capacitors, especially the 4700uf and 2x 2200uf reservoirs as they have been working for 30 years, along with a lot of cleaning out of dust from the casing! QD Drive Replacement Part of the reason to buy a Roland S220 was to design and produce a QD drive replacement. The QD drive uses a single spiral track recorded onto each side of the diskette, and is half like a cassette and half like a 3.5″ floppy drive. 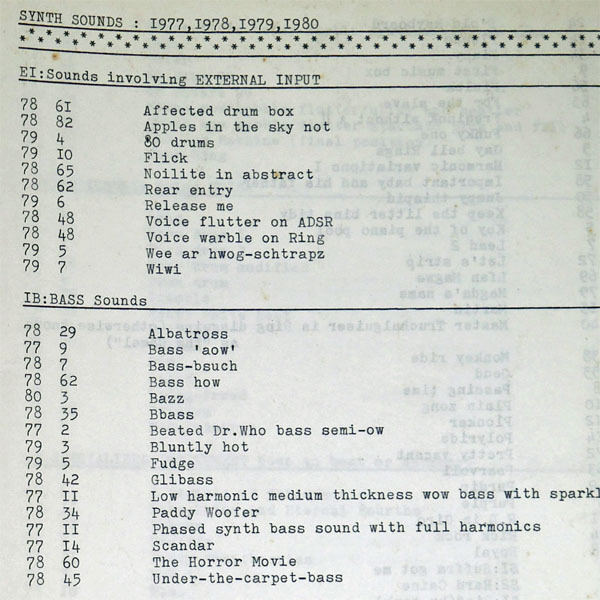 It transfers data slowly at 100 kHz and is encoded in MFM format with 64k bytes each side taking about 5 seconds to load. Samples can be loaded and saved but also the disk can be read to provide the sound name and bank setting. The drive replacement will use a micro-controller to read and write the data, a small OLED display and a SD card for storage. This project will take place in 2Q19 and it has its own dedicated web page here. Overview In 2017 Sound Semiconductor launched the SSI2144 voltage controlled low pass filter, a re-engineered SSM2044. At AMSynths we have used both chips in our modules; the SSM chip in the AM8044 (2014) and the SSI chip in the AM8144 (2018). 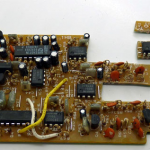 We also make adapter PCB’s that convert the different pin out of the SSI2144 to the SSM2044 pin out, this enables them to be a drop in replacement for synthesizers that use the SSM chip. The SSI chip has a set of minor but worthwhile improvements and specifically the resonance control has on-chip control, and the Q control current for oscillation has been reduced from 425uA to 400uA. The Q control suggested external circuit is also slightly different to the SSM version. 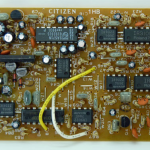 So lets hear and see a comparison between the two chips with the same input signal at 50Hz from an Emu Systems Modular VCO, as I dial up the resonance from zero to maximum. Original SSM2044 Here is the SSM chip manufactured in March 1987 notice the longer duration before oscillation comes in. Re-imagined SSI2144 And now the SSI chip from 30 years later, notice the oscillation comes in quicker. In our modules we use the recommended Q external circuits for each chip, and we trim the onset of oscillation when setting up the modules for customer shipment. So our modules will sound similar. 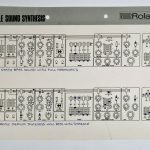 In polyphonic analog synthesizer with a mix of SSI and SSM chips the resonance trimmers will need to be adjusted when a SSM is replaced with an SSI, or better still replace all the 2044’s. 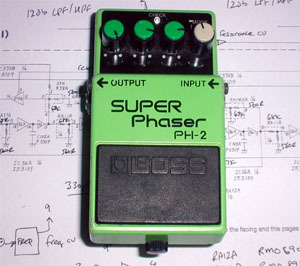 Introduction The Boss PH-2 Phaser pedal contains two valuable Roland IR3109 OTA chips. 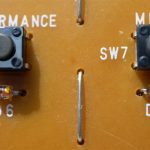 This post explains how they can be carefully removed and used in the AMSynths AM8109 JP8 VCF or the AM8060 JP6 VCF module. 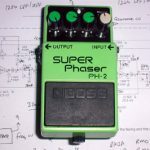 The PH-2 was manufactured for nearly 20 years, from the early 1980’s until at least 2000 by Boss (Roland) and is available second-hand from 20 – 90 GBP depending on condition, try not to pay more than 40 GBP. Customers following these procedures do so at their own risk and there is no guarantee of success made by AMSynths. Buy a Boss PH-2 We bought this pedal on eBay in November 2014, it is serial number FN21896 and was produced in March 2000. The first stage is to remove the paxolin PCB from the pedal. Undo the 4x black posidrive screws in the base of the pedal. Remove the base plate and clear plastic protector. Pull the PCB out of the case, it is attached via a grey ribbon cable and 10 wires. Cut the wires and ribbon cable near the PCB and there you have it – the PCB with two IR3109 chips. Nice!! The second stage is to extract the IR3109 chips from the PCB. We prefer to cut the chips out before then carefully desoldering the pins. Using a coping or fret saw cut around the two chips very carefully, you may want to remove some components by clipping them out with cutters, so that you get straight and safe cut lines. 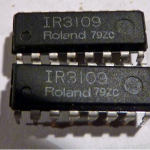 Now remove each IR3109 attached to the PCB as 2 separate sections. Mount the small PCB section in a pin vice upside down. Cut through the back of each PCB very carefully between each set of 4 pins. Make sure you don’t cut down into the IR3109. Heat the solder pads of the first section and using a pair of fine nose pliers gently ease the PCB section off the 4 pins. DO NOT OVERHEAT the Pins or IR3109. 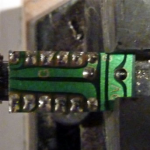 Alternatively you can use a de-solder pump and not cut the PCB into sections. Note: We have found the IR3109 to be a robust chip which is not over sensitive to static or heat. But PLEASE take care! They also seem to last many years (decades in fact), it is rare for us to find one that has failed. Of course it’s worth testing your pedal before you extract the chips, so that you know the chips are working. Once you have removed each IC from the PCB section…. Using de-solder braid remove excess solder from the front and back of each IC pin. Straighten up the 16 pins with fine pliers. Optionally use flux remover to brighten up the pins. Wash the chip in water if you do this procedure, and allow to dry. 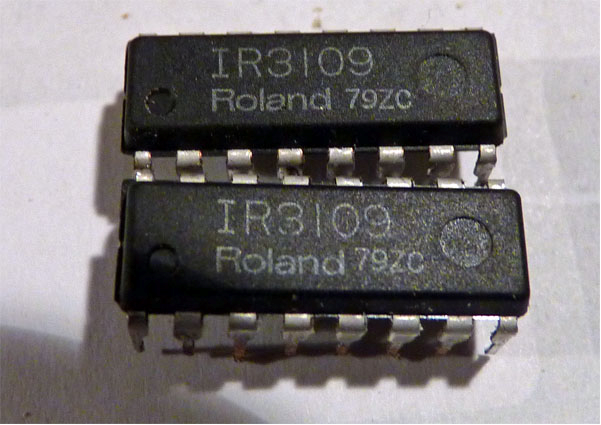 You now have a nice clean IR3109 chip! We usually put them in IC holders to protect the pins, and to enable them to be quickly fitted to a PCB. You may break an IC pin on removing the chip or the pin may break because it is fragile. Don’t worry, they are easy to repair. Mount the chip in an IC socket and feed a resistor wire into the top of the socket and align to the damaged pin. Then carefully solder the wire and pin together. Introduction I picked up a Roland Jupiter 4 voice card on eBay in late 2017 in good condition. In June 2018 I started a project to build a complete single Jupiter voice based around this card. The synth will fit into a Moog 60 HP case (another eBay find) with an aluminium front panel that replicates (most of) the controls of the Jupiter 4. To create a fully working single synthesizer voice means a lot more electronics are required than just the voice card! 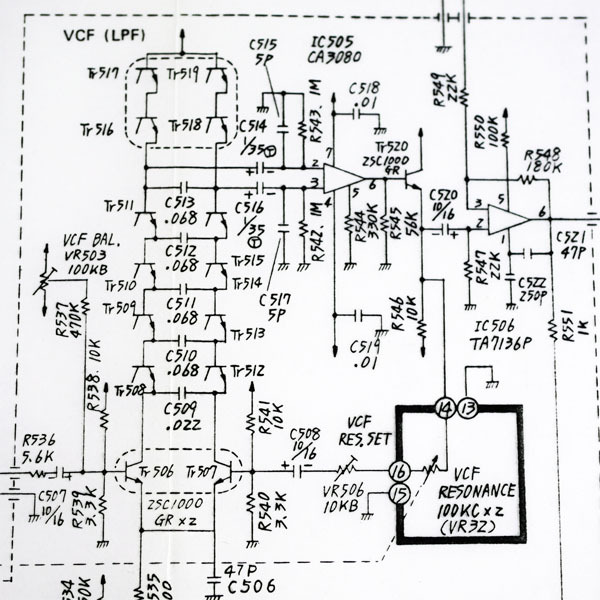 The complex module controller card has to be replicated along with a LFO. The arpeggiator has been left off the synth as it requires the 8048 micro-controller, which means no programmabilty or presets either. The JP4 modulation capabilities have been retained and enhanced, with a 5-axis thumb joystick and a revised S&H circuit for the VCF modulation. 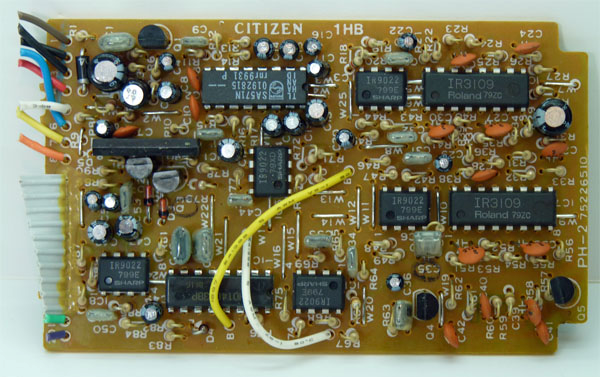 Voice Card This is an early 1979 D version of the card with a BA662 based low pass filter. The first job was to clean and dry the card and remove the metal guides. This reveals 4 mounting holes for the top of the PCB. The 4 green connectors are replaced with 9 pin SIP headers, so the card can be mounted to a new motherboard PCB. Some of the ceramic capacitors needed replacing and the trimmers will be replaced with high quality cermet Bourns trimmers. A hack to the card to add a potentiometer to adjust the VCA Gain trim has been removed and a trimmer put back on the PCB. The card is spaced 12 mm from the motherboard. I am hoping the voice works, but I am sure there will be some repairs needed. The card has additional power supply caps mounted on the rear, which I have retained. Module Controller The Jupiter 4 has a dedicated 5th card in the card frame to hold all the circuits that translate and mix the programmable CV voltages for the Voice Card. It also contains the CMOS based envelope clock generators. All these circuits have been put on the Motherboard PCB of the Jupiter One which measure 295 mm x 105 mm. The module control circuits and Noise circuit has been retained, augmented with the S&H from the Jupiter 8 and revised LFO. 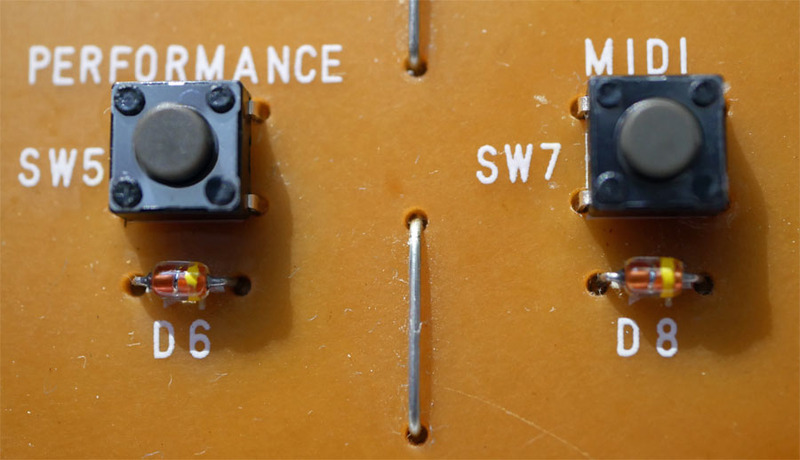 Op amps have been upgraded to TL072’s and BA6110 OTA chips replace the BA662’s. This PCB is spaced 11 mm from the panel PCB and it contains the +/- 15V power rails, dervied from a switched and precision LDO power supply. Jupiter LFO The LFO in the Jupiter 4 is on the main board and is very similar to the one used in the Jupiter 8. 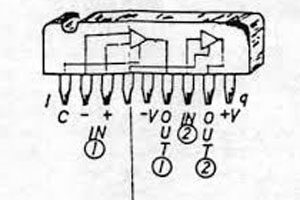 The JP4 version uses discrete FET switching and a two chip CMOS 2 to 4 address decoder, this is rather component intensive and a simpler approach is needed. Fortunately the Jupiter 8 LFO has the same waveforms and can be switched by a 4052 analog switch and then boosted before being used in the voice cards. 4-Way Switch The Jupiter 4 relies on 4-way slide switches which are difficult to source, but we think we have the right one. It will mean make sub PCB’s to raise it up to the right level, but its the simplest electronic solution. 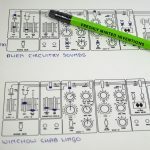 The JP4 micro-controller decodes them into 2-bit binary signals for use in the Controller and Voice cards, which we can copy for the Pulse Width Modulation, LFO Wave Form and VCF Keyboard Follow. Panel PCB The front panel PCB is 295 mm x 105 mm and contains 19 slide potentiometers, 4 rotary potentiometers, 2 rotary switches, 11 slide switches, the joystick and 4x jack sockets. The PCB mounts to the Motherboard via a set of 9 pin SIP sockets and headers. It is spaced 11 mm from the front panel. Joy Stick The Jupiter One has a small thumb sized 5-axis Joy Stick mounted on the front panel. 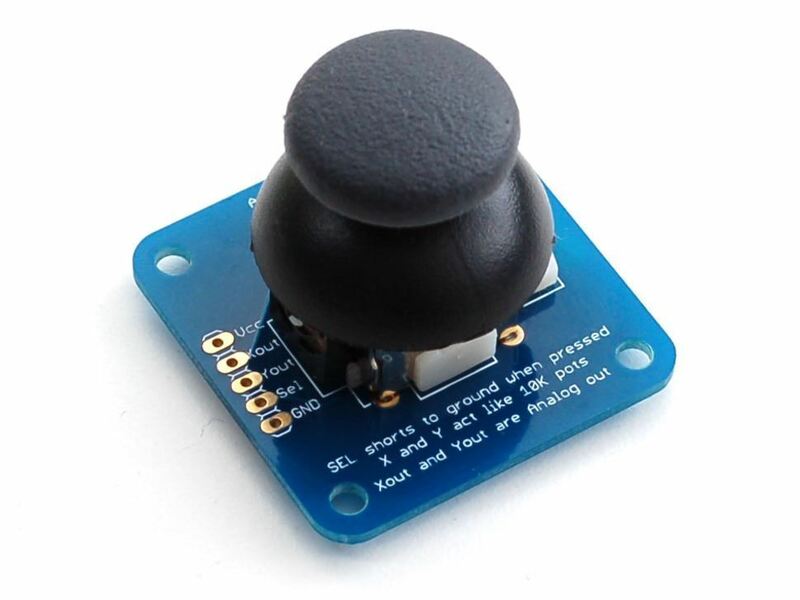 This controls the Bend (X axis) and LFO Depth (Y axis) with the integrated push switch acting as Gate On. This provides excellent control over 3 of the synths key parameters. 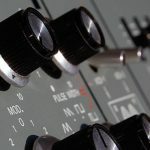 The Jupiter 4 Modulation controls (next to the keyboard) have been retained so that the Bend Amount and LFO can be patched into the VCO, VCF and VCA. Inputs & Outputs The external connections have been kept to a practical minimum to conserve panel space, so this is not a semi modular. There are inputs for CV and Gate, as well as the X and Y CV’s that over ride the joystick if plugged in (Bend and LFO Depth). 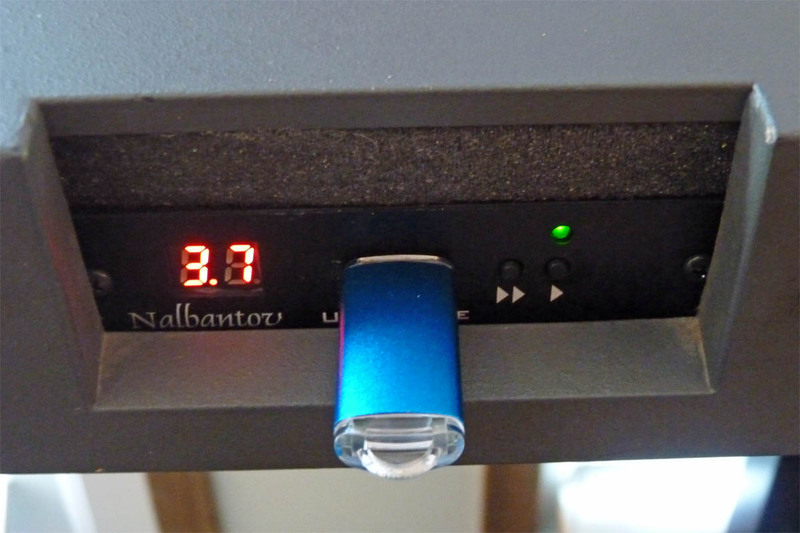 The 6.35 mm analog output jack is mounted on the rear of the 60 HP case, along with the 12V AC power supply input. Missing Controls The lack of micro controller means there is no arpeggiator or presets or portamento. 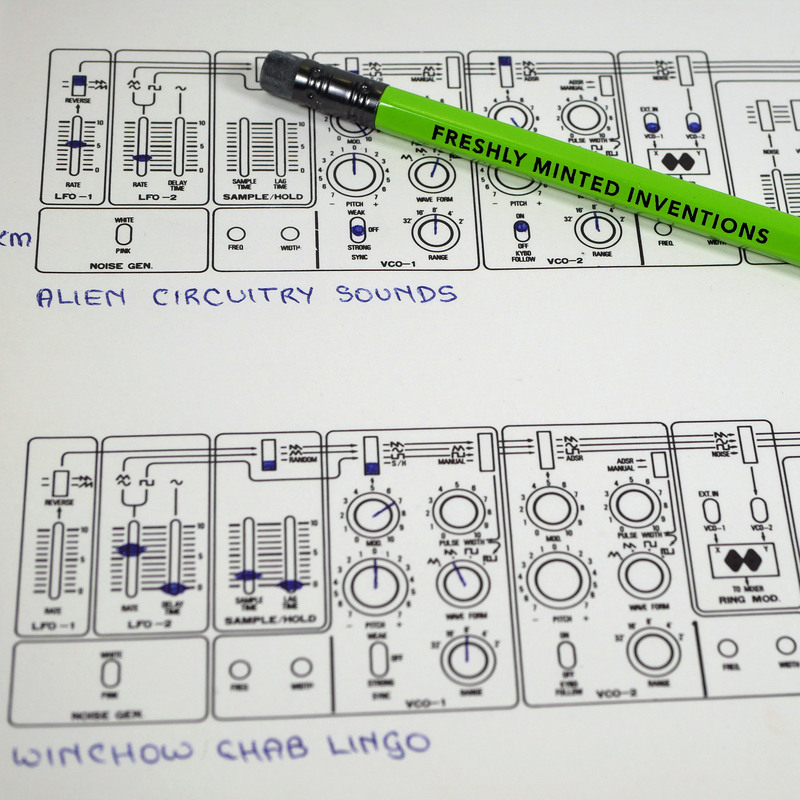 The Trigger Section of the synth therefore has not been included (like the Pro Mars). 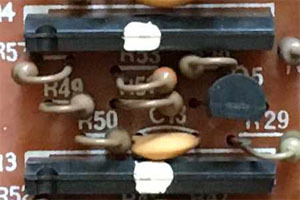 The transpose switch has been replaced by having a 4 octave range switch. Commercial Option I may release the Jupiter One as a commercial project using new Jupiter 4 voice cards based on the BA6110 and a BJT expo generator to replace the ua726. 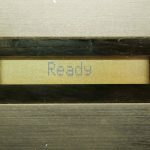 DIY and completed synths may also be available. A two voice version is planned (same 60 HP case) with programmable presets and OLED display. Introduction I first bought an Emax rack sampler back in 1989 for £1200 and spent a lot of time making samples and trying to find the factory samples on diskette. In 1991 I visited the Emu Systems factory in California and tried to get a SCSI upgrade, but of course I had an early model and the upgrade was impossible. I then moved onto EII and EIII samplers in the 1990’s, whilst also finding an Emax SE HD keyboard which I used for a few months with a SCSI ZIP100 before I had to sell all my studio gear in 2003. Emax 2018 Fast forward nearly 30 years and I found an Emax keyboard for sale at a reasonable price in Portsmouth and in good condition. I upgraded the LCD to a very nice blue OLED display that is an exact replacement, as well as a new USB floppy emulator replacing the rather old and damaged floppy drive. I have five USB sticks with two containing the Emu Systems factory library and the other 3 for my samples. I am now sampling a range of synths in the studio as well as using found sounds. OLED Display is a Vishay O016N002CBPP5N0000 available from Mouser for £15, its an exact drop in, you just need to add 1 14 pin male header. It has a wide viewing angle, is very clear and not too bright. 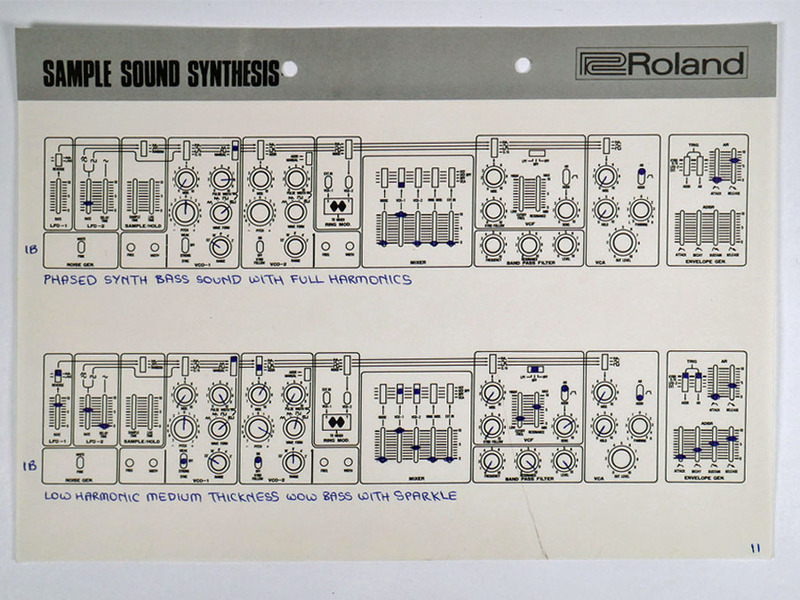 Overview The BA662 is a custom made DC controlled variable transconductance amplifier (or OTA) that Roland had manufactured by Rohm from the late 1970’s and is now obsolete. There are two types of chip with different suffices; the A version has been selected for lower offset than the B version. They are further classified by gain/gm. The BA662B can only replace another BA662B, whilst an A can be used in either application. To quote Roland from the 100M Service Manual: “Color has great importance in circuits of some models”. 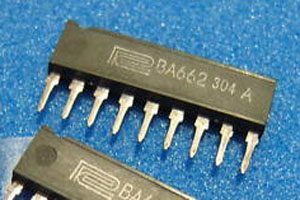 However there is nothing mystical about the sound of the BA662, it is just a reasonable good OTA chip which is often carefully matched and selected. Roland required exact matching of colour dot in some applications (e.g. portamento in the Jupiter 4), and within +/2 colours for others. This need for measurement and matching was obviously costly and led to the BA662 being replaced by precision OTA chips like the IR3109, which were also smaller. The BA662 lived on in some Boss pedals but was ultimately retired. 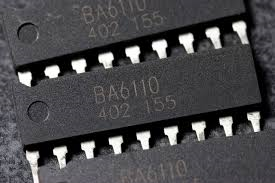 BA6110 The more recent Rohm BA6110 OTA chip is similar to the BA662, albeit with a slightly different pin out, and it too is now obsolete. It is 3-7dB louder in the same circuit, has low offset (3mV) and low distortion (below 0.2% typically) when the linearizing diodes are used. 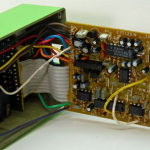 We use the BA6110 in many AMSynths circuits (often matched), as they are still available, work well and are low cost. 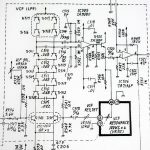 Other designers have used the LM13700 or even dual transistor based clones of the BA662 (which are a lot more expensive than using the BA6110!). 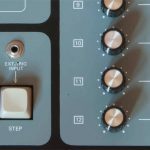 The AMSynths web site is back with a revised WordPress based site with the fantastic slider theme.